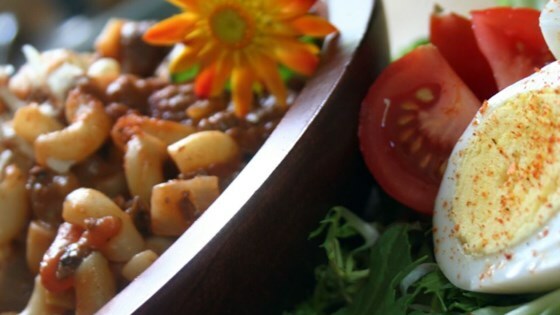 "A favourite at our house - a yummy rich goulash minus the meat. You can substitute the Quorn™ for tofu that's been shallow fried or sliced mushrooms. Hope you enjoy! Serve with rice, noodles, or potatoes." Heat the olive oil in a large skillet over medium heat, and saute the onion 5 minutes, until tender. Mix in the green pepper and mycoprotein pieces, and saute 5 minute, until the pepper is tender. Mix in the garlic and paprika. Stir the tomatoes with their juice into the skillet. Mix in the wine, oregano, and tomato puree. Bring the mixture to a boil. Reduce heat to low, and simmer 25 minutes, until thickened. Just before serving, stir in the sugar, and season with salt and pepper. Yum! Easy to make also. I used Boca meatless ground burger instead of Quorn, and it turned out great. Fantastic! I did this recipe tonight and my partner loved it, even if he is not vegetarian! Great!